Launchpad: Abraham made a proclamation at the first sight of his woman, Eve. He publicly told the creation “This is the bone of my bones, the flesh of my flesh”. He was telling the creations that ‘Heeeey, I have found someone who is comparable to me! I have found my lifetime companion, my helper! Look and behold, she looks just like me. I am no longer alone! The bone of my bones is standing right next to me!’ He was the happiest man on earth (of course he was the only man). And you can imagine he was just from a deep sleep and a divine surgery! The first entrance of a woman into this world was received by praise. Who are you to change nature? It’s true there are good women out there, but you chose the best. She stood up above the host of the ladies you had an eye on. She emerged the winner in the conquest. That’s your wife. She excelled bruh! So whenever you have an opportunity, adorn her with praise. Praise her when you are just the two of you. Praise her around family and friends. Praise her in the midst of your colleagues and friends. Praise her to the world. Put her right on top of the hill and decorate her with praise. After all, she’s yours for keeps. Clothe her with the fragrance of uplifting attributes. It works miracles. There’s so much in her world you can commend and shout aloud. I know she will never get full so don’t tell me that you will be giving it in doses. From the seen to the unseen, there’s just a lot you can praise. Praise her when she prepares you a nice meal. Commend her when she finishes that course that had really worked her up. Encourage her when she’s trying to get back in shape after a pregnancy or a season. Praise her for her wins and gains. Praise her for being a wonderful mother. Admire her beauty, both the outward and inner beauty. Some PDA will crown it all. Commend her on her promotion, her leadership among the women, her dedication to serve you and serve God. 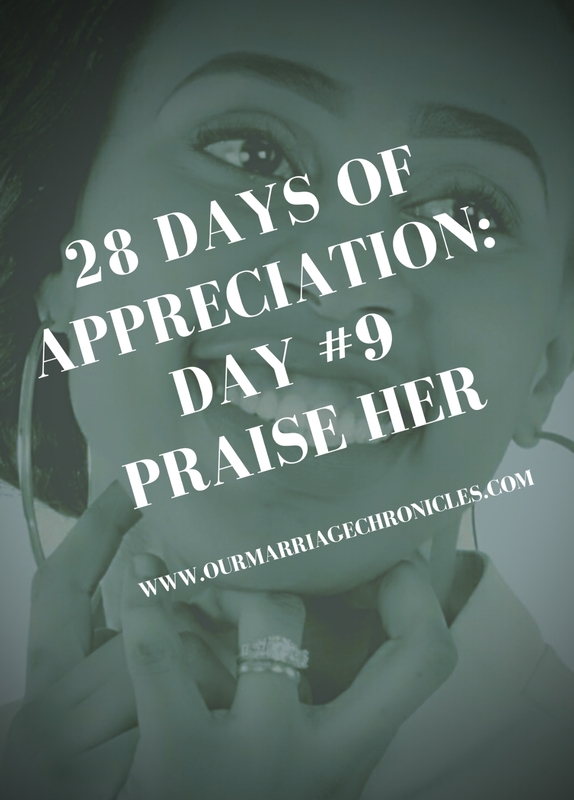 Praise and admiration gives a woman the right perspective about herself. Her self esteem shoots up whenever she’s praised. Her soul is rejuvenated with every word of admiration and commendation. She glows and lightens up. It’s part of her emotional growth and security. A wife who is praised commands respect among her peers. Her walking will say it all. Her confidence is built up. She’s inspired and energized to be best she can be for you. Why deny her all these benefits? Besides every successful wife is a husband who praises her. The vice-versa is also true. Feed her today and let’s compare notes in the future. God of Wonders and all Glory, your excellence is reflected in me for you created me in your own image. Bless me with words of praise for my wife. May I make use of every opportunity to commend her for the good things she does and who she is.